Don’t miss this exclusive one-day educational and networking event on May 9, 2014 in Newark, NJ. 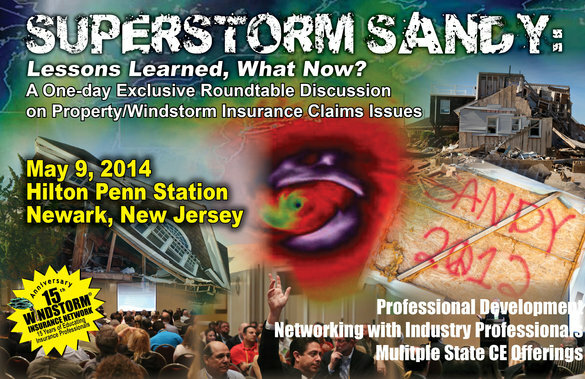 Join top industry professionals as they lead interactive educational roundtable discussions on property/windstorm insurance claims issues. This year’s theme is “Superstorm Sandy: Lessons Learned: Now What?” In addition, keynote speaker, Boston Marathon Survivor and Amputee, Heather Abbott will speak on “Overcoming Adversity.” As the one-year anniversary of the bombing takes place on April 21, 2014, Heather will share her story while inspiring attendees with her contagious optimism and remarkable recovery and triumph over tragedy. Both panel and keynote roundtable sessions will offer small-setting venues for learning and networking in an interactive and informal educational setting. Facilitators will generate valuable discussion topics, while encouraging the exchanging of ideas and knowledge in the property/windstorm insurance claims industry. In addition, attendees can earn CE credits for multiple states and bar associations, as well as network with leading industry professionals.